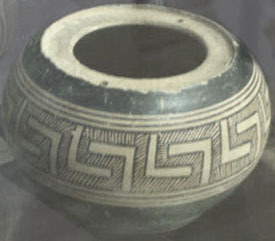 The Geometric style, from 900 to 700 BC, introduces many patterns. They are mostly rectilinear and some remain common for centuries. The meander is the most typical pattern. Geometric also introduces human and semi-human figures, first singly, then in groups which make meaningful narratives. Letters can now also be inscribed or painted on the surface. The introduction of narrative and of alphabetic inscriptions indicate that Greeks were making contact with more advanced cultures of the Near East; as they traded they also learned. Narrative becomes the hallmark of the finer figure-decorated pottery, particularly of Athens. Writing becomes common, for a variety of purposes, but is rarely used as a caption to identify the content of the picture.